Currently 436 available in stock. Special Features: High Air Flow with RGB Lighting - Equipped with two 200mm RGB fans in the front, the MasterCase H500P guarantees high volume intake of fresh air. 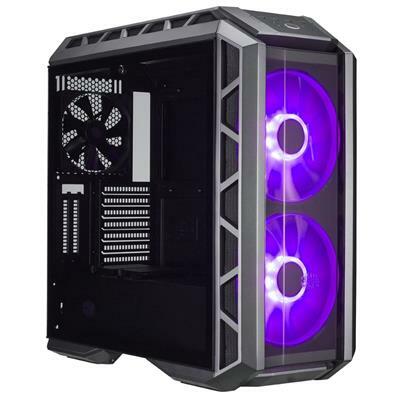 Use the RGB lighting to create a captivating build in your preferred colour theme.‚Covers for Clean Building - A PSU shroud, CPU cut out, and additional cable covers take clean cable management to the next level. Assemble clean builds like a pro!‚Show Off Your Graphics Card - Two additional PCI slots at the rear enable you to show off one graphics card in the vertical position.‚Clear View Inside - The MasterCase H500P has a light grey tinted tempered glass side panel and plastic top/front covers, making it ideal for showcasing your build with (RGB) lighting.‚Liquid Cooling Ready - The MasterCase H500P accommodates up to 360mm radiators on the top and front.